Released on Friday, the new Childish Gambino augmented reality Playmoji character doesn't just look like the music, film, and TV star (aka Donald Glover), it also duplicates his iconic dance moves in the real world. 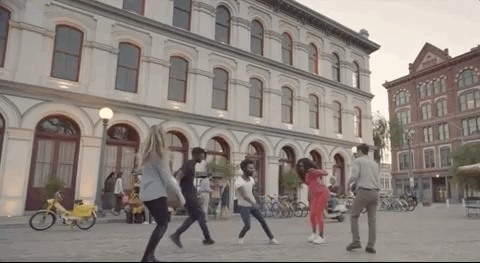 "We worked closely with Childish Gambino and his music video choreographer, Sherrie Silver, to make sure the Playmoji's dance moves rival those of Childish Gambino himself," said Elisabeth Morant, Google's Playground product manager, in a blog post about the release. "By using ARCore's motion tracking, light estimation, and ability to understand the real world, his Playmoji looks and feels lifelike, whether he's in front of you or in a selfie next to you. He even reacts to your facial expressions in real time thanks to machine learning — try smiling or frowning in selfie mode and see how he responds." If you're a Childish Gambino superfan, you'll be happy to know that the experience maps Childish Gambino's moves to three of his songs, including "This is America," "Redbone" (a song Apple also covered using Animoji), and "Summertime Magic." Currently, the feature is only available to those using the Google Pixel, Pixel XL, Pixel 2, Pixel 2 XL, Pixel 3, and Pixel 3 XL smartphones. You can get it working by going through the process as we've described before, which simply involves opening the Playground app (formerly known as Stickers), pointing your camera at a real-world scene, and dropping Glover into your real-world space. This release delivers on the sneak peek we were given of the experience last year and builds on other Playmoji releases including The Avengers and Star Wars. So far, Apple's Animoji are a lot more precise and personal, but Google's Playmoji are, well, just a little more fun.